This studio offers a large sleeping area with a double bed, an additional sofa bed , a kitchen with a sitting area , bathroom and terrace . Please note that the room rate is based on 2 guests. Maximum occupancy is 4 guests . Apartment with 1 bedroom This apartment offer a large bedroom with a double bed, living room with sofa bed for 2 people and sitting area, bathroom and a kitchen . Please note that the room rate is based on 2 guests. Maximum occupancy is 4 guests . This apartment consists :2 separate bedrooms , a kitchen with dinning room , a balcony , and bathroom. This apartment consists of 2 separate bedrooms, each with a double beds. There is also a sofa bed for 2 in living room , a kitchen with sitting room, a balcony , terrace , toilete and a bathroom. Please note that the room rate is based on 4 guests. Maximum occupancy is 6 guests . 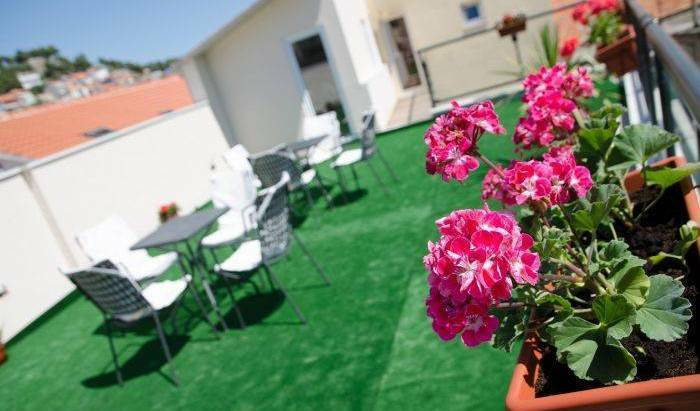 Aparthotel Bellevue is located in a very center of Trogir , it is well adjusted to a modern lifestyle and is a perfect combination of high standard and comfort. This studio consists of a sleeping area with a double bed and a large sitting area with a sofa bed for one person, a kitchenette and a bathroom. This studio consists of a sleeping area with a double bed and a large sitting area with a sofa bed for two person, a kitchenette and a bathroom. One-Bedroom Apartment - consists of a large bedroom with a double bed plus a sofa bed for one person, a balcony overlooking the sea and the old town, a big and well-equipped kitchen and a living room with a sofa bed for 2 persons. Two-Bedroom Apartment -This apartment consists of 2 separate rooms, one with a double bed, the other with 2 single beds. There is also a sofa bed for 2 in the lounge area, a kitchen, a balcony and a bathroom. Apartment Studio Agava is 20m2 + 20m2 terrace. It has one living room with 2 convertible couches, kitchen, bathroom with shower and nice terrace . 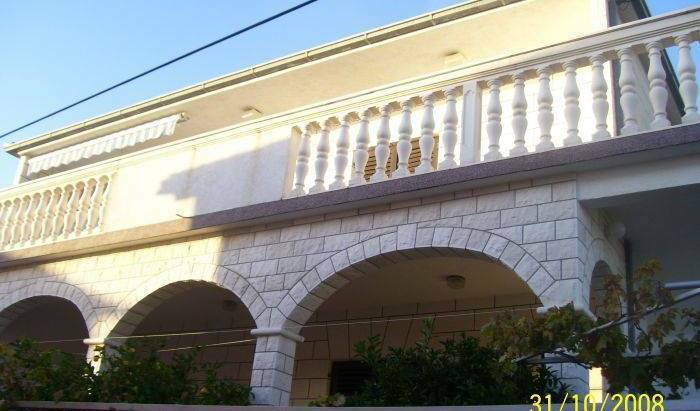 Apartment Pinia is 35 m2 + 9 m2 balcony. It has two rooms, kitchen, bathroom and nice balcony with beautiful view. Apartment Adria is 85 m2 + 25 m2 balcony. It has 3 rooms(2 bedrooms and one living room), kitchen and bathroom with tub. when you stay in your room you can enjoy in spirit of past centuries and beauty of Trogir. 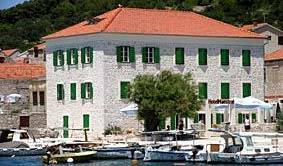 Palace Derossi is a small antiqe hotel in a centre town Trogir.. 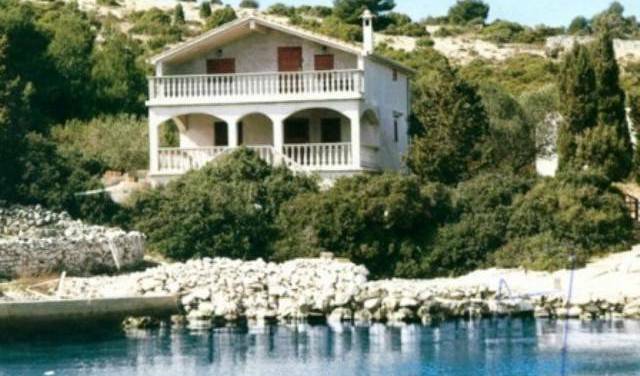 Surrounded by Mediterranean vegetation, very close to the sea, hotel ‘’Villa Katarina’’ provides you accommodation in Trogir with designed equipped rooms with the beautiful sea view. 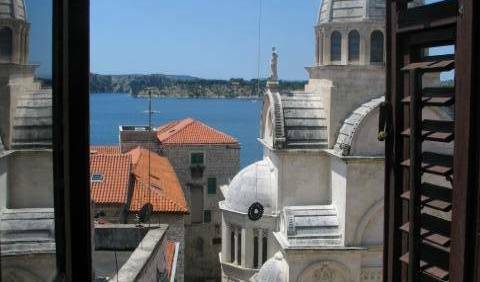 City hostel je smješten u samom središtu starog dijela grada Trogira koji je pod zaštitom UNESCO-a. Hostel se nalazi na jedinstvenoj lokaciji u srcu Trogira, na glavnom trgu (Trg Ivana Pavla II), odmah preko puta katedrale sv. Lovre. City hostel is situated in the UNESCO-listed historic center of Trogir, in a house dating back from the 14th century. Hostel is located on unique place in the heart of Trogir, on main square (St John II square), right across Cathedral of St. Lawrence. Guests can choose between different common rooms as well as bathrooms. All rooms offer air-conditioned accommodation and beside every bed is a jack and a night light. In the building area there is a salon with SAT TV, restaurant which serves dalmatian cuisine. Bedspreads, blankets and towels are free, and guests also have the access of hostel's safe. The hostel offers free Internet access and wake-up service. Hostel's personnel is available 24 hours a day, and they can also help you organize picnics, tours and other different activities. Dear visitors, We welcome your visiting the Internet pages of our villa, Villa Paula. 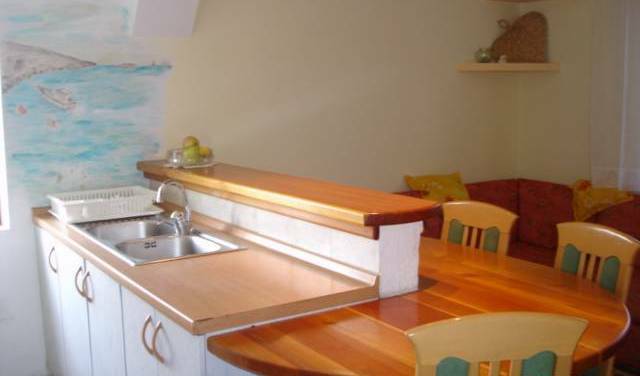 Apartmans Ivona, Trogir, near city center and sea.